Imagine that you’re investigating the compromise of a system. The system doesn’t have PowerShell Logging enabled, but you did capture a process dump while activity was happening. Use !Help to see all of the features offered by the SOS CLR Debugging Extension, but one useful one is !DumpHeap. It enumerates all of the objects in managed memory, and lets you filter these by type. We can see that there were 6 items of HistoryInfo (commands typed by the attacker), and 7 arrays of HistoryInfo (internal data structures that hold them). The heap includes objects that are temporarily in use, so not all of these represent unique commands. If we click on the MT column for HistoryInfo itself, we’ll get that type of object explicitly. Then, we can click on any of the Addresses to see what that HistoryInfo contains. Clicking is just a shortcut for the commands that WinDbg ultimately shows in the output anyways: !DumpHeap /d -mt 00007ff8a140be70 and !DumpObj /d 0000024226256100. There’s a string at offset 8 that contains the _cmdline itself. What’s in it? You can click (!DumpObj /d 0000024226255a30) to find out. Ah, yes. The eternal existential question. Who am I? We’ll iterate through the !DumpHeap results, assigning each memory address to a ‘historyinfo’ variable. We’ll echo that original memory address to the screen, and then remember that the _cmdline was offset 8 from that memory address. So, we’ll use the poi function to calculate the address of that new object, and use !DumpObj to dump it. That gives us a bunch of output that we can then review, or script even further. In our forensic analysis of this image, we can see that we are in trouble indeed. After they ran ‘whoami’, they knew the username and password of the Domain Admin, and then used PowerShell remoting to connect to the Domain Controller with it. User interfaces are great for initial analysis, but terrible for scale. To automate scenarios like this, you can use this WinDbg Automation module I shared a little while ago. It leverages cdb.exe – the console version of WinDbg. From there, you can do all kinds of crazy stuff. As cool as that module is, I’m most excited by far about the recent open sourcing of DbgShell. This is the hobby-time project of @JazzDelightsMe, and exposes much of the debugging engine into PowerShell as PowerShell objects. Incredible! If you have a large collection of documents (source code or text files), searching them with PowerShell or your favourite code editor can feel like it takes forever. How is it that we can search the entire content of the Internet in milliseconds, but searching your local files can take minutes or hours? It turns out that there is a solution built into many products and technologies that can help us: the Apache Lucene project. Lucene forms the search engine backbone for many popular products: Solr, Twitter, ElasticSearch, and at least a few hundred others. Unfortunately for us, however, it comes as a software development kit and not a simple tool that you can use from the command line. With the introduction of a Scour – a new PowerShell module – that all changes. Scour is a PowerShell module that lets you search any directory on your computer using the power of the Lucene search engine backend. After you run an initial indexing process, future searches are tens or hundreds of times faster than the searches you are currently used to. By default, Scour indexes text files (*.txt) and the source files for popular programming languages. If you want it to index additional file types, you can use the –Path parameter. Scour will first scan the current directory (and subdirectories) to determine how many files it has to index, and then displays a progress bar to let you know how much time is left in the indexing process. By default, Scour returns the files that match your query. You can pipe the results into Select-String, Copy-Item, or anything other scripting you might want to do on these results. If you start your search from within a specific directory, Scour automatically limits your results to documents in that directory or below. If you want to search for specific regular expressions within your files, Scour lets you combine the efficiency of indexed document searches with a line-by-line regular expression match. To do this, add the –RegularExpression parameter to your call. Here’s an example of finding all documents that have the word “following” in them, and then returning just the lines that match the regular expression “follow.*Cambri.*”. If you want to restrict your searches to a specific file type (i.e. : *.cs), you can use the –Path parameter to Search-ScourContent. So you’re interested in submitting a talk for a security conference? Awesome! Above all else, what keeps our industry moving forward is the free and open sharing of information. Submitting a talk can be a scary experience, and the process for how talks are evaluated can feel mysterious. So what’s the best way to create a good security conference CFP submission? Is this presentation innovative and useful? Is this presentation likely to be able to deliver on its outline and promises? Is this presentation consistent with the values of the conference? They are also likely going to review submissions in an extremely basic web application or Excel. Let’s talk about how you can create a good CFP submission based on the questions reviewers are asking themselves. Will this presentation be of broad interest? If a conference is split into 5 tracks, accepted presentations must be interesting to about 20% of the attendees. If your talk is too specialized - such as the latest advances in super-theoretical quantum cryptography - you might find yourself talking to an audience of 4. A common problem in this category is vendor-specific talks. Unless the technology is incredibly common, it will just come across as a sales pitch. And nobody wants to see a sales pitch. That said, some talks are of broad interest exactly because they are so far outside people’s day-to-day experience. While an attendee may never have the opportunity to experience the lifestyle of a spy, an expose into the life of one would most certainly have popular appeal. The security industry is incredible at sharing information. For example, @irongeek records and shares thousands of videos from DerbyCon, various BSsides, and more. DEF CON has been sharing videos for the last couple of years, as has Black Hat and Microsoft’s Blue Hat. If an audience member is interested in a topic, there’s a good chance they’ve already watched something about it through one of these channels. In your CFP submission, demonstrate that your presentation is innovative or useful. Does it advance or significantly extend the current state of the art? If it’s a 101 / overview type presentation, does it cover the topic well? Content outlines that could never be successfully delivered in the time slot allotted for a presentation. Descriptions of research that is in progress that the presenter hopes will bear fruit. Or worse, research that hasn’t even started. Exaggerated claims or scope that will disappoint the audience when the actual methods are explained. Some presentations are racist, sexist, or likely to offend attendees. This might not be obvious at first, but slang you use amongst your friends or coworkers can come across much differently to an audience. These ones are easy to weed out. Many conferences aim to foster a healthy relationship between various aspects of the community (i.e. : researchers, defenders, vendors,) so a talk that is overly negative or discloses an unpatched vulnerability in a product is likely not going to be one that the conference wants to encourage. On the other hand, some conferences actively cater to the InfoSec tropes of edgy attackers vs defenders and vendors. You might find an otherwise high-quality Blue Team talk rejected from one of those. Some submissions may appear to skate a fine line on this question, so good ones are explicit about how they will address this concern. For example, mentioning that the vulnerability they are presenting has been disclosed in coordination with the vendor and will be patched by the time the presentation is given. Those are some of the major thoughts going through a reviewer’s mind as they review the conference submissions. Here are a couple of common mistakes that make it hard for a reviewer to judge submissions. Is the talk outline short? If so, the reviewer probably doesn’t have enough information to evaluate how well the presentation addresses the four main questions from above. A good outline is usually between 150 to 500 words. See talks 3, 4, and 5 from the screen shot above to see how this looks in practice! Does the title, description or outline rely heavily on clichés? If so, the presentation is likely going to lack originality or quality – even if it is for fun and profit. Is the talk overly introspective? Talks that focus heavily on the presenter (“My journey to …”) are hard to get right, since attendees usually need to be familiar with the presenter in order for for the talk to have an impact. Many review processes are blind (reviewers don’t know who submitted the session), so this kind of talk is almost impossible to judge. Is the talk a minor variation of another talk? Some presenters submit essentially the same talk, but under two or three names or variations. What primarily drives a reviewer’s decision of a talk is the meat, not a bit of subtle word play in the title. They will likely recognize the multiple variations of the talk and select only one – but which one specifically is unpredictable. When votes are tallied, three talks with one vote each are much less likely to be selected than a single talk with three votes. Is the submission rife with grammar and spelling errors? I don’t personally pay much attention to this category of mistake, but many reviewers do. If you haven’t spent the effort running your submission through spelling and grammar check, how much effort will you spend on the talk itself? FireEye recently posted some research about an attack leveraging the NetSupport Remote Access tool. 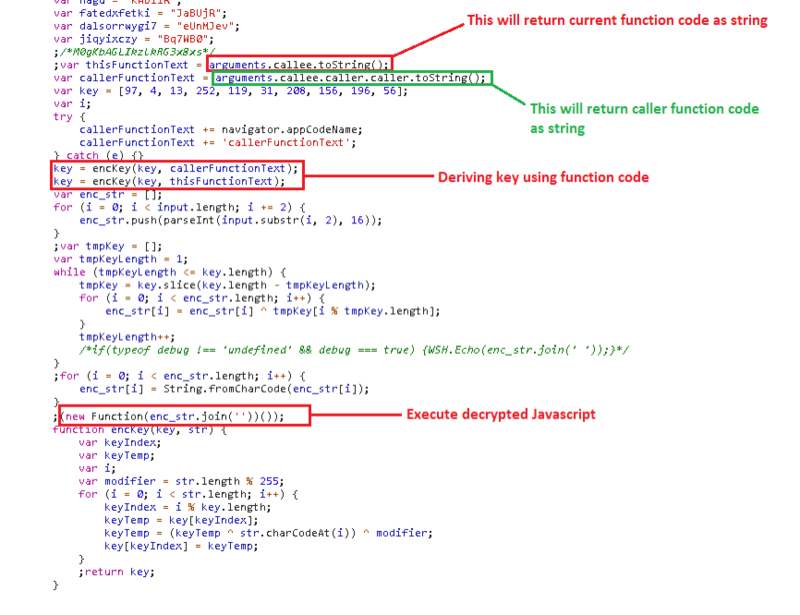 The first stage of this attack uses a lot of obfuscation tricks to try to make reverse engineering more difficult. David Ledbetter and I were chatting about some of the lengths the malware authors went through to obfuscate the content. Unlike most malware that obfuscates content by XORing the content with a single byte / key, this malware appears to do something much more clever. See the content starting at ‘var tmpKeyLength = 1;’? When malware uses step #1 alone -- or even a repeating single-key XOR -- I like to call it “Encraption”. It appears complicated, but is vulnerable to many forms of cryptanalysis and can be easily broken. Given that this malware did several levels of Encraption, did they manage to finally invent something more secure than a basic repeating key XOR? So, encraption with two keys is still just encraption with a single key and is vulnerable to all of the same attacks. But what about that rolling key? The malware above used something more like a rolling key, however. It didn’t take a couple of single bytes. If the content was 100 bytes, it did 100 rounds of XOR based on the key. Surely that must be secure. Consider the perspective of a single character. It gets encrapted by one byte of the key, and then a different byte of the key, and then a different byte of the key… and so on. And because XOR is associative, as we demonstrated above, that is the same thing as the single character being encrapted by a single byte. Let’s take a look at a demonstration of this in PowerShell. $stringToEncrypt = [char] "Hello World!" Pretty impressive! Look at all those non-ASCII characters. This must be unbreakable! To get the equivalent single-pass encraption key, we can just XOR the encrapted string with the original string. How? We can do this because XOR is commutative as well: you can rearrange the order of terms without impacting the result. That gives us an equivalent single key that we can use: Key1 XOR Key2 XOR Key3. Notice that some characters (28 at the beginning, c9 at offset 0x48) didn’t even get encrypted at all? Remember folks, don’t roll your own crypto, and especially don’t roll your own crapto. You might have run into situations in the past where you’re looking for some specific text or binary sequence, but that content is encoded with Base-64. Base-64 is an incredibly common encoding format in malware, and all kinds of binary obfuscation tools alike. The basic idea behind Base-64 is that it takes arbitrary binary data and encodes it into 64 (naturally) ASCII characters that can be transmitted safely over any normal transmission channel. Wikipedia goes into the full details here: https://en.wikipedia.org/wiki/Base64. Some tooling supports decoding of Base-64 automatically, but that requires some pretty detailed knowledge of where the Base-64 starts and stops. So when we add a character to the beginning, we shift the whole bit pattern to the right and change the encoding of everything that follows! When final padding is added, you can’t just remove those "=” characters. If additional content is added to the end of your string (i.e. : “Hello World!”), that additional content will influence both the padding bytes, as well as the character before them. Another major challenge is when the content is Unicode rather than ASCII. All of these points still apply – but the bit patterns change. Unicode usually represents characters as two bytes (16 bits). This is why the Base-64 encoding of Unicode content representing ASCII text has so many of the ‘A’ character: that is the Base-64 representation of a NULL byte. When you need to search for content that’s been Base-64 encoded, then, the solution is to generate the text at all possible three-byte offsets, and remove the characters that might be influenced by the context: content either preceding what you are looking for, or the content that follows. Additionally, you should do this for both the ASCII as well as Unicode representations of the string. One example of Base-64 content is in PowerShell’s –EncodedCommand parameter. This shows up in Windows Event Logs if you have command-line logging enabled (and of course shows up directly if you have PowerShell logging enabled). As you can see in this example, searching for the Base-64 content of “My voice is my” returned all four log entries, while the “My voice is my passport” search returned the single event log that contained the whole expression. Get-Base64RegularExpression is a pretty simple script. You can use this in PowerShell, or any event log system that supports basic regular expression searches. ## Offset 0. Sits on a 3-byte boundary so we can trust the leading characters. ## ends up being the number of equals signs, plus one. "(" + (($base64sequences | Sort-Object -Unique) -join "|") + ")"